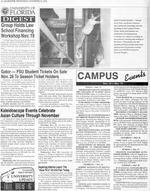 ﻿ "Kaleidoscope Events Celebrate Asian Culture Through November." November 13, 1996. "Kaleidoscope Events Celebrate Asian Culture Through November." November 13, 1996.